1. Pick and clean the rice in running water. Soak the rice in water for 30 minutes. 2. Now you can microwave or pressure cook the rice. You have to cook the rice till its 3/4th done. The rice should not be fully cooked but almost cooked. 3. In a pressure cooker or a microwave cooker, add the pre-soaked rice, all the spices mentioned above, salt. Cook till the rice till is almost done. I microwaved the rice and cooked it for 9 minutes at full power. Fluff the rice and keep it separate. 4. Traditionally biryani were made in clay pots, known as handis. If you have a clay pot, you could use it. I did not have a clay pot or handi. But I have a pressure cooker shaped like a handi, so I used it. If you have a handi shaped pot made up of aluminium, you could use it also. 5. Heat ghee in the handi. 6. Add all whole garam masala: cardamoms, mace, cloves, cinnamon, bay leaves. Fry the garam masala till they crackle. 7. Now add the onions. Fry the onions till golden brown. 8. Add the green chilli, ginger and garlic. Fry for a minute. 9. Add the turmeric and red chili powder. 10. Give the mixture a stir. 11. Now add the vegetables and stir for a minute. 13. Stir and then add 3/4 cup water plus salt. Stir the mixture well. 14. If using a pressure cooker for cooking the veggies, then cover the cooker with a lid and pressure cook for 2 minutes. 15. If not using a pressure cooker, then bring the entire vegetable mixture to a boil. Then simmer until the vegetables are cooked. Add the dry fruits – almonds, raisins and cashew nuts to the vegetable gravy. 16. Check the salt. Add more if required. 17. Warm the milk. Add saffron to it. Let this saffron-milk mixture cool. Add the curd to this mixture and mix well. 18. In the same handi with the cooked vegetables, sprinkle half each of saffron-flavored curd/yoghurt, mint and coriander leaves. 19. Now spread half of the rice. 20. Sprinkle the remaining saffron-flavored curd/yoghurt, mint and coriander leaves. 21. Spread the remaining rice. 22. Sprinkle rose water. This is optional and you could skip it. 23. Place a moist cloth on top. 24. Cover with a lid. 25. Then seal with wheat flour dough or keep a heavy weight on the lid. 26. This is one technique that you could use for dum cooking if you do not have the wheat flour dough. 27. Place the sealed handi on the gas stove at low fire. 28. Cook for 20-25 minutes more. If you think and feel, that you do not want the base to get burnt while cooking the biryani… there is a technique for avoiding this disaster. 29. Right at the beginning, before dum cooking the biryani……. take a tava/griddle and heat it on medium flame. Now keep the sealed handi on the tava. Keep the flame to the lowest and cook for 20-25 minutes. 30. For the first 15 minutes, I dum cooked the biryani on direct low flame and for the last 10 minutes, I placed the handi on the tava and cooked on a low flame. 31. You could also preheat the oven to 190 degree celsius and then bake the biryani in the oven for 15-20 minutes. Please remember to use an oven proof utensil like the pyrex ones for baking in the oven. You will have to assemble the biryani as mentioned above in the oven proof utensil and then bake it. 32. While serving, make sure you equally serve the vegetables as well as rice. 33. Serve the yummy veg biryani with your choice of raita, onion-mint salad-kuchumber, mango pickle, roasted papad. 34. 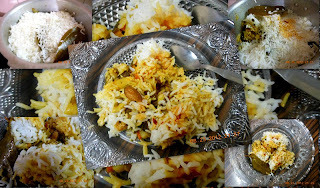 Other accompaniments for this Hyderabad Veg Biryani would be Mirchon ka Salan…. the way the Biryani is traditionally served in Hyderabad.